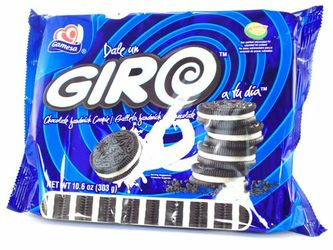 Give your life a whirl with Gamesa's GIRO chocolate sandwich cookies. Its a delicious chocolate cookie with a cream center you won't be able to resist. Its the perfect dessert for kids and adults. Enjoy them even more with a cold glass of milk! 0g trans fat. Dale un GIRO a tu vida con la galleta sandwich de chocolate por Gamesa. Una deliciosa galleta de chocolate con un centro cremoso que no podras resistir. Es el postre perfecto para ninos y adultos. Disfrutalo aun mas acompanandolo con vaso de leche! 0g grasas trans.